After reading an article in Pacific Yachting about clam gardens, which I'd never heard of, I found this site online. For anyone visiting the Broughtons or other west coast areas this might be something to explore. In NJ, they gave been leasing marsh tidal flats for at least decades to commercial clammers. The fallout of these concentrated, highly productive clamp farms are clam rich sandbars in the surrounding area. For 14 years I have been clamming one sand bar that is in front of the commercial clam beds. The sand bar is barely an acre when exposed at low tide, yet produces thousands of clams all summer long. Based on the density of clams being dug, they must reestablish at an amazing rate. I would have thought the area would have been devoid of clams years ago...but it still is very productive. These gardens may be similar as they will enhance an area much larger than themselves. Thanks for posting, I will keep a lookout for clam gardens here on the east coast. Thanks for posting that. Growing up along the Salish Sea, this is new information for me. Very interesting. I have seen them at Mound Island in the Broughtons. I seem to remember a reference from anthropology class that the coastline from Puget Sound, along British Columbia's length and up into SE Alaska had the highest recorded population density on Earth for non agricultural peoples. What they did to reach such numbers and to develop such a refined art form was essentially farm the ocean. Origin stories of the Haida speak of carrying salmon eggs in wet baskets of moss to streams and rivers which didn't have salmon yet. Changing and improving clam beds slowly over thousands of years would be another example. First Nations people have been using and improving this environment for so long, salmon weirs (stones piled into walls to trap salmon at high tide) have been discovered in several hundred feet of water at the bottom of Hecate Strait...because the ocean was that much lower during the last ice age. Here's a photo from the dying bay just to the east of the southernmost basin in Betteridge Inlet, Campania Island, on BC's north coast. Acres of clams! **Edit** Sould have said "drying" bay in post #7, not dying bay!!! Parts of Raritan Bay as well as Oyster Bay are two east coast examples . Still mostly farmed by hand with long specialized "rakes"from skiffs. Lots of commercial farming operations around here, but I had never heard of the building of walls by the native peoples to increase production of clans. The other aspect that is new to me is that if a person created the "clam "garden" then that was a clam bed that they or their family had the rights to. ...The other aspect that is new to me is that if a person created the "clam "garden" then that was a clam bed that they or their family had the rights to. The way it works up here, to the best of my knowledge, is that hunting, fishing, and/or gathering territories are handed down through the mother. So, if someone inherited a clam digging area and did some improvements, they would reap the benefits. This thread reminded me of a product the company I worked at used to build in the early 70s. The Camtrack it was articulated with four driven rubber belt with crossbars tracks, all driven, each track on a walking beam axle. I dont remember what engine but it had very low ground pressure and could navigate swampy, or dry, areas very well. 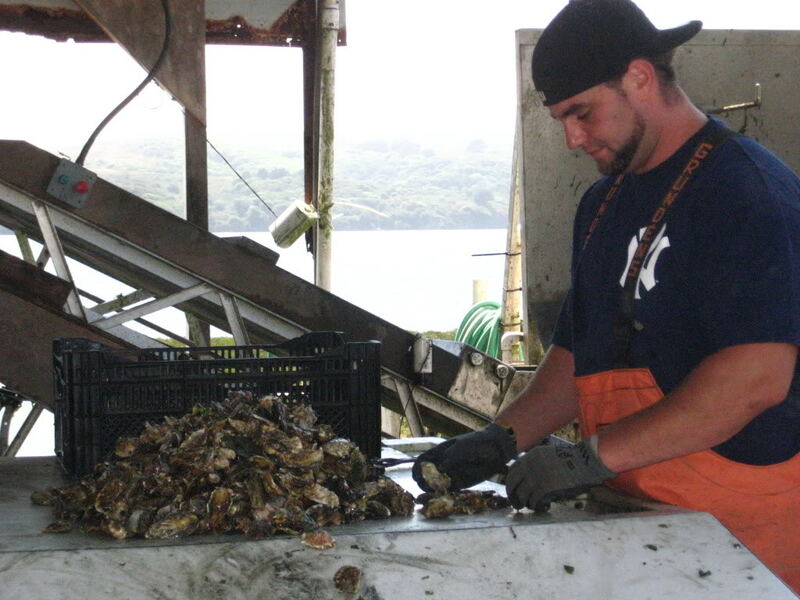 We did sell several in Washington State where they were used in a clam farming operation. I believe it was run by one of the Native American tribes through some government organization or lands. They would drive these Camtraks out to the clam areas at low tide to tend to or harvest the clams. There was not a big market for these things back then, they were fun to drive but expensive, so we dropped the line a few a few years. In today's world where big bucks are spent on toys they probably would be a hit. In Octopus Islands I thought there might be one (picture unfortunately does not do it justice). All the larger rocks are cleared from the beach and rolled down to a line following the low water mark. Knowing that clam gardens are around, and so looking at the beach through a different perspective, it sure does not look like a natural geological occurance. It's hard times for our local oyster companies. They are all over the place. "John" will undoubtedly chime in. There are all sorts of areas on this coast that look like they have been "seascaped" by humans. These areas include both clam gardens as well as fish weirs. And yes, Wiaitt Bay has some as well. Thanks for posting that link, Conrad. I never would have recognized a clam garden even if I walked over one, which I've probably done many times in the past!